In South Africa, supply chain management (SCM) in the public sector has emerged as one of the most topical issues among both management practitioners and researchers. This trend is largely attributable to the role of public SCM on the fulfilment of socio-economic imperatives by the government. It is widely acknowledged that public SCM is an important tool for the development of society through its contribution to both micro- and macroeconomic developments in the country (Dzuke & Naude 2015; Gurría 2016; Harland, Telgen & Callender 2013). Public SCM involves the spending of monetary resources by non-financial public enterprises such as state-owned enterprises, provincial and local governments (Ismail et al. 2014). For instance, it was projected that the South African government's total expenditure would be at least R1.5 trillion between 2016 and 2019, across all spheres of government (South African National Treasury 2016). These funds would be directed to the procurement of goods, services and infrastructural improvements aimed at developing the country in different ways. The Department of Public Enterprises (2017) further reports that by the year 2020, the South African government would have invested in large-scale projects related to water, transport, electricity, telecommunications and infrastructure at an estimated cost of R3.2 trillion. Moreover, data provided by the World Bank showed that by the end of 2016, approximately 20.47% of the gross domestic product (GDP) in South Africa was attributed to public procurement spending (Global Economy 2017). Several authors (Ambe 2016; Khoza & Adam 2005; Mantaris 2014) add that the South African public sector has a significant impact on the economy, particularly the larger public companies that operate in key sectors of the economy, such as energy, telecommunications and transport. It is important, then, for public sector organisations in South Africa to continuously explore ways of improving the performance of their respective supply chains to ensure that their contributions to the national economy are maintained. In spite of its fundamental contributions towards socio-economic development, public sector SCM in South Africa faces high levels of turbulence and uncertainty. As observed by some scholars (Dlomo 2016; Mafini & Pooe 2013; Munzhedzi 2016a) public organisations in South Africa operate in a highly unstable environment, which is both volatile and imperfect, which tends to limit their performance. According to Fourie (2015), unethical conduct involving fraud and corruption cost the South African government large amounts of money each year as fruitless and wasteful expenditure. For instance, in 2014, the South African government spent over R26.4 billion in ways that contravened laws and regulations, including corruption (Smart Procurement World 2014). Further exacerbating this situation is the lack of availability of a skilled SCM workforce, which remains one of the key constraints to the expansion of business operations in South Africa (Department of Higher Education and Training 2016; Heyns & Luke 2012). Policy also remains a major barrier to SCM in the South African public sector, particularly the fragmented and sometimes ambiguous legal status of the different legislative instruments for general and specific SCM practices (Sewpersadh & Mubangizi 2017; Smit 2015). This unclear legal framework creates uncertainty during the application of legal priority, regarding regulatory interpretation in cases of litigation involving SCM (South African National Treasury 2016). Other notable challenges facing public sector SCM include ineffective monitoring and evaluation, the lack of compliance with existing policies, poor planning and too much decentralisation of the procurement system (Ambe & Badenhorst-Weiss 2012a). As a result of these challenges, many South Africans do not trust the SCM processes in the public sector, and the general perception is that the public sector is failing to fulfil its mandate due to systemic problems in the entire public supply chain (O'Regan 2012; South African National Treasury 2016). Service delivery protests that have become commonplace in South Africa over the past few years demonstrate the feeling that people are not receiving the quantity or quality service that they need (Reddy 2016; Sartorius & Sartorius 2015). These issues provide a basis for further scientific inquiries to find relevant solutions. Since public SCM has important socio-economic implications; it is essential to ensure that its processes are both efficient and effective (Ambe & Badenhorst-Weiss 2012b). It is necessary to develop an understanding of the risk factors that act as both constraints and barriers to the successful performance of public supply chains before applying solutions to improve both the efficiency and effectiveness of public sector SCM. As mentioned by Khoza and Adam (2005:16), getting the South African public sector to perform optimally depends on a host of factors. Such factors include but are not limited to the involvement of government (through government policies), the risk of supply, supply chain disruptions, lack of suitable or available suppliers, product performance, information security and internal business processes (Kelman n.d.; Tucker & Gilfilian 2013). An understanding of the effects of these individual risks on other SCM functions can be a tool for the mitigation of these risks, which leads to improved public sector supply chain performance (South African National Treasury 2015). This article aims to test the relationships between supply chain risks, supply chain flexibility and supply chain performance in the South African public sector. The two specific objectives of the study are to determine the influence of supply chain risks on supply chain flexibility and to establish the influence of supply chain flexibility on supply chain performance. It is notable that despite the availability of extensive literature on supply chain risks, supply chain flexibility and supply chain performance (e.g. Ganga & Carpinetti 2011; Hoffman, Schiele & Krabbendam 2013; Sánchez & Pérez 2005; Stevenson & Spring 2007; Thome et al. 2014), the links between these factors remain largely untapped, especially in the African context. Additionally, previous studies focusing on SCM in the South African public sector (e.g. Ambe 2016; Ambe & Badenhorst-Weiss 2012b; Bolton 2006, 2016; Dlamini 2016; Mantaris 2014; Munzhedzi 2016b; Watermeyer 2011) overlooked these dimensional factors, as well as the possible links between them. This disregard for such a relationship is surprising, given the commitment of a lot of organisational resources to minimising the impact of supply chain risks. This study intends to address this existent research gap. It focuses on supply chain flexibility as a response to supply chain risks and assesses whether supply chain flexibility contributes to supply chain performance in the South African public sector. The study is important in that its results can be used by supply chain practitioners in the public sector to manage various risks experienced in the sector as a way of improving supply chain flexibility and performance. In South Africa, the government spends a lot of resources on various payments to many suppliers who provide numerous products and services (Scott 2016). There are over 300 public organisations that make use of public finances (Fourie 2015). The finances are channelled towards the procurement of services that include among other things the provision of education, health care services, communication and postal services, power generation and distribution, and water and sanitation (Dzuke & Naude 2015). The major governing policy frameworks that control SCM activities in South Africa include the Public Finance Management Act of 1999, the Preferential Procurement Policy Framework Act (PPPFA) Act (No. 5 of 2000) and the Municipal Finance Management Act (No. 56 of 2003). In addition to these is the Broad-Based Black Economic Empowerment (BBBEE) Act (No. 53 of 2003), which also provides guidance on how public resources may be used as government acquires products and services. In 2012, the office of the Chief Procurement Officer was also created at the National Treasury to superintend the implementation of the available legislative policies in public SCM (South African National Treasury 2015, 2016). According to the PPPFA and the BBBEE Act, previously disadvantaged individuals and groups are given preference in the allocation of contracts by public sector organisations (Smit 2015). These laws further permit all service providers that do not qualify for preferential points to partner with qualifying service providers, which should result in the development of previously disadvantaged service providers (Nkuna & Nemutanzhela 2012). This process is aimed at promoting fairness and balance in the appointment of service providers. However, the public SCM management process remains inhibited by numerous risks, constraints and pressures that include skills shortages, corruption and fraud, policy inconsistencies, management malpractices, political interference and dissatisfied stakeholders (Franks 2014; Mabelebele 2017). Consequently, the South African public supply chain continues to perform below expectations, which in turn limits the performance of the larger South African economy. Supply chain risks refer to the threat of injury, damage, loss, liability or any other negative occurrences that result from internal or external vulnerabilities within the supply chain and that may be avoided through pre-emptive action (Grose & Richardson 2014). In its risk index report, the Chartered Institute of Procurement and Supply (2017) identified government policies, supply complexity, availability of skills, supplier performance monitoring, information security and process efficiency as some of the most common supply chain risks in the public sector. There is no single standard instrument for measuring these supply chain risks, as various authors have developed and used different scales to suit their contexts. Government policies refer to the regulatory framework within which SCM is implemented, as set by the national government (Colyvas 2014). For the measurement of government policies, Tummers and Knies (2014) developed and validated the Public Leadership Questionnaire, which uses five scales, namely accountability, lawfulness, ethical and political loyalty and network governance, to measure public leadership behaviours. Some of the individual questions in each of these five scales address policy related issues such as communication of policies and encouraging management and employees to follow them. Supply complexity is characterised by a dynamic supply market, unreliable suppliers and an unreasonably high number of suppliers with whom business is conducted, as determined by various factors that include political, economic, technological and social factors, among others (Blome, Schoenherr & Eckstein 2014). Hieber (2002) developed a 19-item instrument for measuring supply chain complexity in terms of collaboration, coordination and configuration. The instrument was subsequently adapted and used by Hashemi, Butcher and Chhetri (2013) in their study that developed a framework for building a better understanding of supply chain complexity, which includes questions for checking the complexity of supply mechanisms in both product-oriented and service-oriented organisations. Skills availability pertains to circumstances in which employers are able to fill or have considerable ease in filling vacancies for an occupation, or specialised skills needed within that occupation at prevailing levels of remuneration and conditions of employment, and reasonably accessible locations (Cappelli 2015). There are numerous instruments developed by different researchers to measure the availability of skills in organisations. For instance, Gibson and Cook (2001) developed an instrument for hiring practices in third-party logistics firms in the USA. Min and Emam (2003) created an instrument for developing the profiles of logistics truck drivers for their successful recruitment and retention. Mitra (2006) developed questions for use in a survey of the third-party logistics (3PL) service providers in India. In these three instruments, specific aspects concerning the availability of skills, such as the ability of the organisation to fill vacancies, the motivation of employees and levels of turnover are emphasised. Supplier performance monitoring involves measuring, analysing and managing a supplier's ability to comply with, and preferably exceed, their contractual obligation (Lysons & Farrington 2012). For the measurement of supplier performance monitoring Prajogo et al. 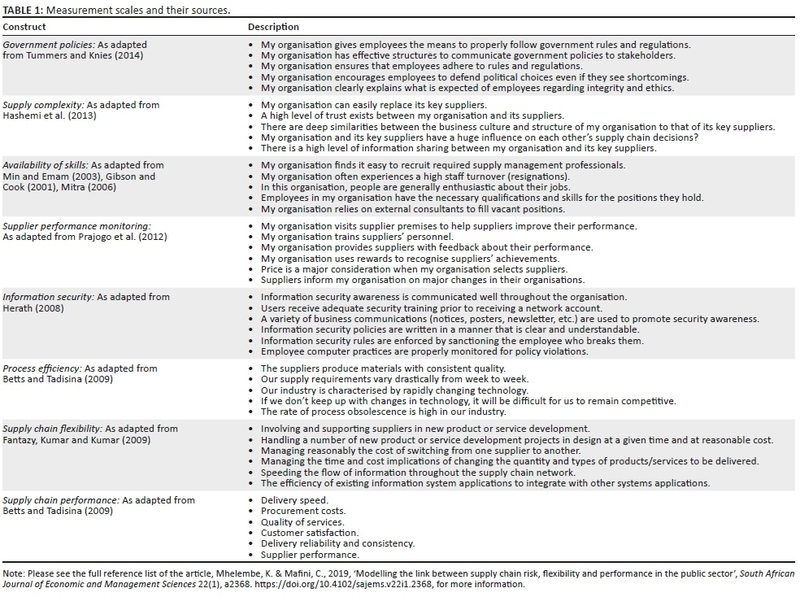 (2012) used a multidimensional perspective to test the relationship between supplier management and operational performance in different firms. Their instrument also tested for the efficiency of the systems and procedures in place to monitor the performance of suppliers, using parameters such as site visits to supplier premises, training of suppliers, providing feedback to suppliers and rewarding suppliers, among others. Information security is the preservation of confidentiality, integrity and availability of information (Spears 2006). Measures developed by Herath (2008) dwell on the importance of information security in organisations, capturing issues such as information security awareness in organisations and the role of communication in enhancing this awareness, the development of policies and the provision of training to the managers and employees. Process efficiency is intended to ensure that more outputs are achieved using fewer resources in all sets of steps or tasks that the organisation repeatedly employs to create a product or service, reach a specific goal or provide value to a customer or supplier (Dohmen & Moormann 2010). To measure process efficiency, a comprehensive instrument was developed by Betts and Tadisina (2009) who integrated issues such as supply, demand and technology into organisational processes to overcome environmental uncertainties. Supply chain performance is a monitoring process of undertaking a retrospective analysis to determine whether proper processes have been followed and if the desired objectives have been achieved within the supply chain (Beamon 1999). One of the basic objectives of SCM is to increase total supply chain performance, which is sometimes referred to as supply chain effectiveness (supply chain service level) and efficiency (supply chain cost) (Christopher 2012). According to Hult, Ketchen and Slater (2004), SCM is not a support function for implementing business strategy, but is specifically meant to drive an organisation's performance and become a key element of the overall strategy for the entire chain. Supply chain performance and the effective management of a supply chain have increasingly been recognised as critical factors in enhancing organisational performance (Agus 2011). Supply chain performance can be measured using different metrics, such as supplier performance, operational performance, customer satisfaction and financial performance, among others. In some cases, it is possible to use these metrics objectively, if the actual statistical data are made available. However, in a study by Betts and Tadisina (2009), supply chain performance was measured subjectively, using five parameters, namely customer satisfaction, delivery speed, procurement costs, quality of services, delivery reliability and consistency, as well as supplier performance. These measures were adapted for use in the present study. The conceptual model presented in Figure 1 was developed for this study. The model identifies six supply chain risk dimensions that are the predictor variables (constructs). These are government policies, supply complexity, skills availability, supply performance monitoring, information security and process efficiency. The mediating variable is supply chain flexibility, which in turn connects to supply chain performance, which is the outcome variable. The relationships are connected using seven hypotheses (H1 to H7) that were tested in this study. The study submitted to the positivist paradigm since it was intended to test several apriori hypotheses to determine relationships between the independent and dependent variables (Taylor & Milton 2013). To test these relationships, a quantitative approach was used, as this allows generalisation of the results of the study to other public supply chains in different environments. A survey design, which involved the collection of data using questionnaires, was utilised for this study since it is associated with representativeness, impartiality, being systematic, reliability and objectivity (Creswell 2014). A cross-sectional strategy, which involved the collection of data from respondents once in a specific period (Denscombe 2014), was used to conduct the research. The sample was composed of supply chain professionals in the South African public sector drawn from state-owned enterprises and government departments based in Gauteng. The province of Gauteng was deemed appropriate because it houses the head offices of most South African public sector organisations. To select the sampling elements from the target population, this study adopted the non-probability sampling approach using the convenience sampling technique. The convenient sampling approach was deemed appropriate for the study because there was no single sample frame or list from which the names and details of supply chain professionals in the South African public sector in Gauteng could be obtained. Using the suggestion by Altunisik et al. (2004) that sample sizes between 30 and 500 at 5% confidence level are generally sufficient for most quantitative studies, the sample size was initially pegged at n = 500 respondents. A survey questionnaire was distributed to supply chain professionals in the South African public sector in Gauteng between March and May 2017. A combination of the drop and collect method and emails were used to distribute the questionnaires. Measurement scales were operationalised using questionnaires that were validated in previous studies. The measurement scales and items used, as well as their sources, are indicated in Table 1. Response options for sections measuring supply chain risks were presented on five-point Likert-type scales anchored by 1 = strongly disagree and 5 = strongly agree. For the sections measuring supply chain flexibility and performance, response options were presented in a five-point Likert-type scale anchored by 1 = much worse than the industry average and 5 = much better than the industry average. After the screening of all received questionnaires, data were then captured on a Microsoft Excel spreadsheet. The spreadsheet with the captured data was also cleaned to identify and correct missing entries. This was followed by importing the data into the Statistical Package for Social Sciences (SPSS version 24.0) format. Once the data were formatted, the next step was to use descriptive statistics to analyse the data about the demographic profile of the respondents. The last stage of data analysis included the use of structural equation modelling (SEM) using the Analysis of Moments Structures (AMOS version 24.0) statistical software. After administration of the questionnaires, a total of 307 usable questionnaires were recovered, giving a satisfactory response rate of 62%. An analysis of the demographic distribution of these respondents revealed that a majority of them (89%; n = 274) were male while the largest group (37%; n = 112) were aged between 34 and 41 years of age. With regard to educational qualifications, the majority of respondents (73%; n = 223) were in possession of a diploma. Regarding work experience in SCM, most of the respondents (55%; n = 168) had been working in the public sector for between 10 and 15 years. Almost all of the respondents (99%; n = 304) were black while the largest group (87%; n = 265) were employed as specialists in various SCM-related jobs. This study was intended to test the relationships between supply chain risks, supply chain flexibility and supply chain performance in the South African public sector. To achieve this, a SEM approach was adopted to test for these relationships. According to Anderson and Gerbing (1988), this involves a two-step approach, which begins with the testing of the psychometric properties (reliability, validity and model fit) of the measurement instrument through confirmatory factor analysis (CFA). A testing of the hypotheses through the path analysis approach then follows. The results of the CFA tests are reported in Table 2. In testing for reliability, scale purification was conducted using item-total correlations. As recommended by Nunnally and Bernstein (1994), all items with item-total correlations below 0.3 were removed to improve the reliability of the measurement scales. Two items were subsequently removed from the supplier performance monitoring scale, one item was removed from the information security scale and two items were removed from the supply chain performance scale. As shown in Table 2, item-total correlations for all retained scale items were above the recommended minimum value of 0.3, which resulted in a scale with acceptable reliabilities. Further tests for reliability included two measures, namely the Cronbach's alpha coefficient and composite reliability (CR). Cronbach's alpha values for the measurement scales ranged from 0.72 to 0.83, which are well above the recommended threshold of 0.7 (Cho & Kim 2014). The composite reliability test is an alternative to the Cronbach's alpha test in testing for reliability and is directed to examine the internal steadiness of each research construct (Raykov 2012). Composite reliability values were well above the recommended 0.7 threshold, as they ranged between 0.75 and 0.85. This demonstrates that reliability, as measured by these indicators, was satisfactory in this study. In the study, content validity was ascertained through a pilot test of the questionnaire since the measurement scales used in this study were adapted from scales developed for other studies. The pilot study was conducted using 50 conveniently selected supply chain practitioners drawn from various public sector departments in Gauteng. Respondents that participated in the pilot study were excluded from the main survey. Feedback obtained from the survey was used to adjust the questionnaire to improve its content validity. Improvements made to the questionnaire related to the wording of the questions, arrangement of questions and the length of the questionnaire. In addition, a reliability test of the pilot data was conducted, which ensured that all data fell within recommended thresholds. The third type of validity ascertained in this study is construct validity, as measured by its two variants, namely convergent validity and discriminant validity. Convergent validity refers to the degree to which two measures of constructs that theoretically should be related are in fact related (Kline 2011). In contrast, discriminant validity tests, whether concepts or measurements that are supposed to be unrelated are, in fact, unrelated (Henseler, Ringle & Sarstedt 2015). Convergent validity was measured using factor loadings and the average variance extracted (AVE). The recommended threshold for individual factor loadings of all the items in a measurement scale is 0.5 (Westland 2015). 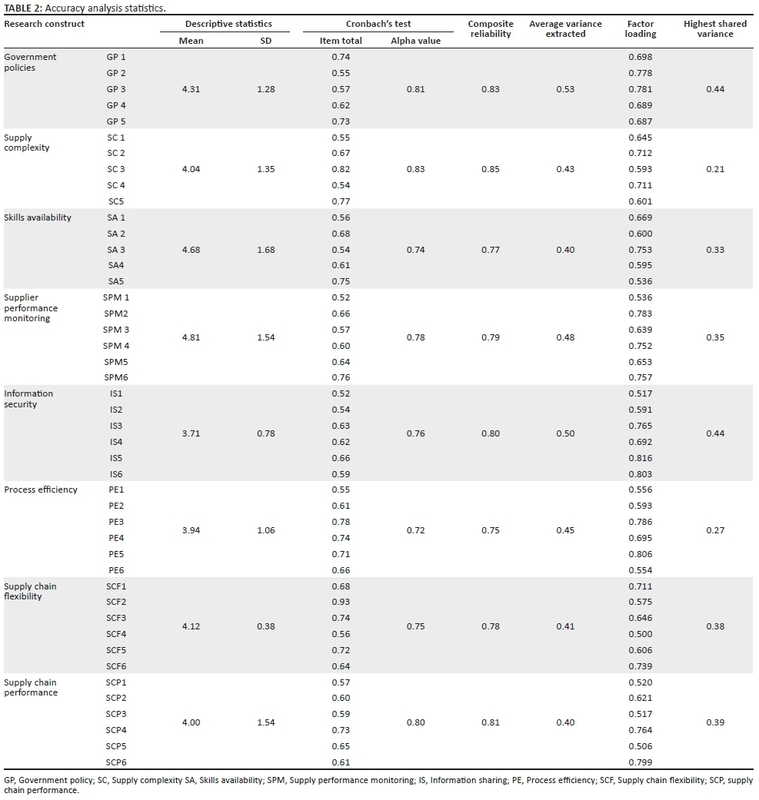 As indicated in Table 2, factor loadings for all items in the measurement scales were above the minimum threshold of 0.5, which demonstrates that convergent validity was satisfactory in this study. The AVE measures the level of variance captured by a construct versus the level due to measurement error; values above 0.7 are considered very good, whereas the level of 0.4 is acceptable (Alumran et al. 2014). As indicated in Table 2, AVE values were above the suggested 0.4 threshold value for all measurement scales. This further shows that convergent validity was acceptable in this study. Two procedures were used to measure discriminant validity. Firstly, it was expected that the AVE values for each construct would be higher than the corresponding highest shared variance (HSV). Shared variance is the extent to which the variations between two correlated variables of a construct tend to overlap (Gefen & Straub 2005). In this study AVE values for each construct were higher than the HSV for these constructs, thereby demonstrating that discriminant validity was adequate. Secondly, discriminant validity was ascertained through the use of correlations between constructs, as derived from the CFA model. Positive correlations less than 0.8 are more acceptable for testing for discriminant validity (Fornell & Larcker 1981). As indicated in Table 4, inter-factor correlations were lower than 0.8, which attests that discriminant validity was adequate in this study. According to Anderson and Gerbing (1988), model fit analysis is a process that assesses how well the model represents the data. In this study, model fit was tested by using the following indices: Chi-square/degrees of freedom, comparative fit index (CFI), incremental fit index (IFI), Tucker-Lewis index (TLI), normative fit index (NFI), goodness of fit (GFI), adjusted goodness of fit (AGFI) and random measure of standard error approximation (RMSEA). The acceptable thresholds should be equal to or higher than 0.90 for CFI, IFI, RFI, NFI, GFI and AGFI. For Chi-square/degrees of freedom a ratio of 3:1 or less is recommended and RMSEA value should be equal to or less than 0.08 (Lysons & Farrington 2012). 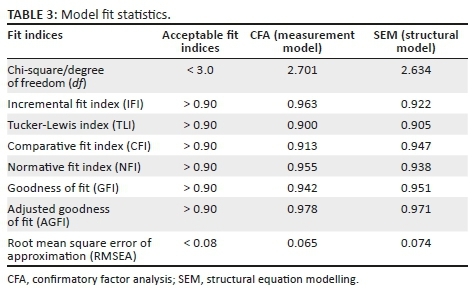 The general model fit indices for both the CFA and SEM models are presented in Table 3. As revealed in Table 3, the Chi-square test showed values of 2.701 and 2.634 for the CFA and SEM models, which were both lower than the recommended highest cut off value of 3.0, and were thus acceptable. The values for the IFI, TLI, CFI, NFI, GFI, AGFI indices were acceptable since they fell above the recommended minimum threshold of 0.9 for both the CFA and SEM models. For the RMSEA, the values for the CFA and SEM models were 0.065 and 0.074, which were acceptable since they were lower than the recommended maximum cut off value of 0.08. Therefore, all thresholds were satisfied for both the measurement and the structural models, thereby confirming the acceptability of model fit in this study. The correlations between all constructs used in this study are shown in Table 4. In addition to their usefulness in testing for discriminant validity, inter-factor correlations are also important in determining the strength and direction of associations between the constructs. Table 4 indicates that the inter-factor correlations (r) were significant and ranged between −0.722 (p < 0.01) and 0.836 (p < 0.01). The positive correlations show that an increase in one factor leads to a positive increase in the other factors. For instance, an improvement in government policies would lead to improvements in other factors such as skills availability, supplier performance monitoring, information security, process efficiency, supply chain flexibility and performance within the public sector. Conversely, the negative correlation between supply complexity and other factors suggests an inverse relationship between them. Thus, an increase in the complexity of supply is likely to lead to either decreases or negative growth in the other factors. Hypotheses were tested using the SEM procedure. The results are reported in Table 5. The first column in Table 5 represents the structural path that was tested, or the proposed relationship between any two constructs. 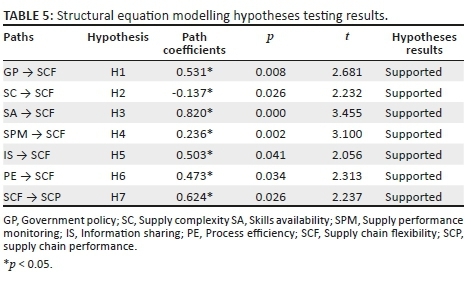 The second column shows that a total of seven hypotheses, labelled as H1 to H7, were tested in this study, with each hypothesis being linked to a specific path. The third column contains the path coefficients, which are the beta (β) values that show the predictive power (effect or influence) of the independent construct on the dependent construct. The fourth column represents the statistical significance of the relationship, measured at a level of 0.05, which depicts that should this statistic be satisfied, there is a 95% probability that the result of that test is true. The hypothesis is only accepted if the significance level is less than 0.05. The fifth column represents an alternative statistical significance measured through the t statistic, which should also be significant for a hypothesis to be accepted. The final column shows that all hypotheses were supported, since they were statistically significant, as supported by the path coefficients, p-values and t-values. All relationships were positive, except the second hypotheses which proposed that increased supply complexity leads to decreased flexibility of the public supply chain. The first hypothesis of the study (H1) suggested that effective government policies lead to increased flexibility of the public supply chain. This hypothesis was supported in this study since government policies were statistically significant (β = 0.531; p = 0.008; t = 2.681) in predicting supply chain flexibility. This result implies that effective government policies act as a catalyst for supply chain flexibility in the public sector. An enabling policy framework (Hanks, Davies & Perera 2008; Turley & Perera 2014) usually supports public supply chains that can adapt and respond to changes with minimum costs regarding time, cost, quality and performance. Despite the availability of the various legislative frameworks, the public supply chain in South Africa remains inflexible and continues to face many challenges. Although public SCM in the country aims to promote principles of good governance and introduce a fair preferential procurement system (Ambe 2016), this has not been achieved. The public sector SCM system is highly decentralised, which is meant to allow managers within the different arms of government to control it. This has, however, made the SCM system highly fragmented, making it difficult for the government to obtain maximum value in the purchase and use of goods and services (South African National Treasury 2016). The second hypothesis of the study (H2) suggested that increased supply complexity leads to decreased flexibility of the public supply chain. This hypothesis was supported because supply complexity was statistically significant (β = −0.137; p = 0.026; t = 2.232) in predicting supply chain flexibility. The negative beta result implies an inverse relationship between supply complexity and supply chain flexibility, such that the latter decreases as the former increases. Thus, it would be expected that a public supply chain exposed to a highly complex mix of supply would be unable to respond positively to any disruptive changes occurring in that supply chain. The third hypothesis of the study (H3) suggested that availability of skills leads to increased flexibility of the public supply chain. This hypothesis was supported because skills availability was statistically significant (β = 0.820; p = 0.000; t = 3.455) in predicting supply chain flexibility. This result illustrates that the availability of qualified, knowledgeable and well-experienced human resources in the public sector improves the flexibility of that supply chain. A supply chain that is equipped with adequate and appropriate human resources can easily adapt and respond to any changes occurring within the market (Gómez-Cedeño et al. 2015). It also has to be noted that among the six supply chain risk factors considered in this study, skills availability scored the highest beta value. This demonstrates that the availability of skills is the most important and critical supply chain risk factor in determining the degree of flexibility within the South African public supply chain. The fourth hypothesis (H4) proposed that the monitoring of supplier performance leads to increased flexibility of the public supply chain. This hypothesis was supported in this study because supplier performance monitoring was statistically significant (β = 0.236; p = 0.002; t = 3.100) in predicting supply chain flexibility. This result denotes that a public supply chain is likely to be highly flexible, provided the performance of suppliers to that supply chain is monitored. Lack of monitoring and evaluation across the entire South African public sector is a key area of deficiency (Nelson 2016). The deficiencies in monitoring and evaluation are linked to the absence of an effective control environment, and departments are placed in a difficult position to give effect to or implement monitoring and evaluation (Fourie 2011; Govender 2013). This has resulted in deviations or non-compliance that typically goes undetected or are identified after the fact (Nkuna & Nemutanzhela 2012). The fifth hypothesis (H5) proposed that effective information security leads to increased flexibility of the public supply chain. This hypothesis was supported in this study because information security was statistically significant (β = 0.503; p = 0.041; t = 2.056) in predicting supply chain flexibility. This result validates that the more secure the information used in the public sector is, the more adaptable to changes the supply chain will be. Information security pertains to the prevention of unauthorised access, use, disclosure, disruption, modification, inspection, recording or destruction of information (Spagnoletti & Resca 2008). It is a general term that can be used regardless of the form the data may take. The chief area of concern for the field of information security is the balanced protection of the confidentiality, integrity and availability of data while maintaining a focus on efficient policy implementation without hindering organisation productivity. Given the high information technology illiteracy among many supply chain professionals in the South African public sector (Mkhize 2015; Sebake & Coetzee 2013), information security remains a major threat and could emanate from any of the available potential sources. The sixth hypothesis (H6) suggested that process efficiency leads to increased flexibility of the public supply chain. This hypothesis was supported in this study because process efficiency was statistically significant (β = 0.473; p = 0.034; t = 2.313) in predicting supply chain flexibility. By implication, the adoption and implementation of efficient processes and procedures within the public sector lead to better supply chain flexibility. Process efficiency itself is the capability of human resources to conduct a certain process in the way that ensures minimised consumption of effort and energy (Malakooti 2013). Process inefficiency was identified by several authors (Ambe & Badenhorst-Weiss 2012a; Crous 2002; Fourie & Poggenpoel 2017) as a major factor affecting the implementation of SCM in the South African public sector. It thus remains that process efficiency still has to be addressed since it is a major risk facing public SCM in the country. The seventh hypothesis suggested that supply chain flexibility leads to the increased performance of the public supply chain. This hypothesis was supported by this study because supply chain flexibility was statistically significant (β = 0.624; p = 0.026: t = 2.237) in predicting supply chain performance. This result suggests that the higher the flexibility of a public supply chain, the greater the performance of that supply chain. The result also shows that supply chain flexibility mediates the relationships between each supply chain risk and supply chain performance. The first limitation of the study is that the respondents were based in Gauteng only. The second limitation is that the study did not consider all supply chain risks that exist in the public sector since this would have been beyond the scope of a single study. In addition, the use of the convenience sampling technique increased the susceptibility of the research sample to sampling bias. Several suggestions for future research can be put forward. Firstly, since the study was inclusive of various public sector departments, future studies should consider specific government entities separately, such as state-owned enterprises, municipalities, government departments and constitutional entities. The scope of the study could be expanded to other supply chain risks excluded from this current study, such as among other things economic factors, social factors, political factors, environmental risk, human behaviour risk and legal risk. Since the current study was conducted using the quantitative methodology, a different view would be to conduct a similar study using a mixed method approach, which also involves the qualitative methodology where interviews are conducted. The results of the study could be more informative if the views of consultants working in the public sector were included and compared. This presents the need for conducting similar studies using perceptions of consultants working temporarily in the public sector's supply chain departments. Since data were collected from supply chain professionals based in Gauteng, future samples could also include those provinces that were excluded from this study. The results of this study provide statistical evidence that there is a relationship between supply chain risks, supply chain flexibility and supply chain performance in the South African public sector. While there is a lot of literature on supply chain risks, supply chain flexibility and supply chain performance, information on their relationship, specifically in the South African public sector, is rare. 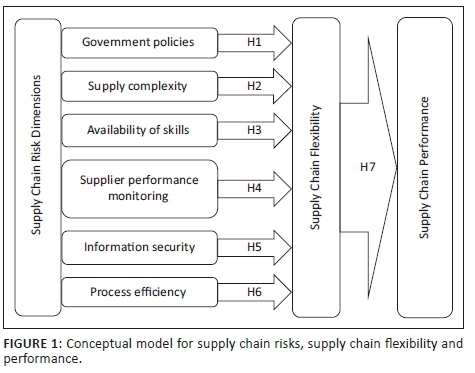 The study validates that supply chain risks, in this case government policies, supply complexity, availability of skills, supplier performance monitoring, information security and process efficiency exert significant influences on supply chain flexibility, which in turn influences supply chain performance in the public sector. The study further reports that supply chain flexibility can be improved through the management of the individual risks considered in this study, which, in turn, leads to superior supply chain performance. The present study is important in several ways. Theoretically, the study is an addition to the available literature on supply chain risks, supply chain flexibility and supply chain performance. It is also an important source of information on research methodologies for future studies in SCM. Furthermore, the study provides a specific conceptualisation of the relationship between supply chain risks, supply chain flexibility and supply chain performance within the South African public sector, where no similar study had been conducted before. Practically, the study provides information to supply chain professionals in the South African public sector regarding the improvement of supply chain performance. It underscores that the performance of public supply chain in South Africa can be improved by managing the six risk factors considered and their contribution to supply chain flexibility. This denotes that where supply chain underperformance is a challenge, such as when service delivery is inadequate, the solution is to minimise the effects of the risks mentioned in this study, which improves the flexibility of that supply chain. This, in turn, will lead to better supply chain performance. In this fashion, this study provides an important solution to the services delivery challenges facing the South African public sector. The solution is to mitigate the available supply chain risks, which fuels the flexibility of that supply chain, leading to better performance. The authors thank the Research Directorate at Vaal University of Technology for providing funding for the conducting of this study. K.M. developed the research concept, performed the literature review and collected data. C.M. compiled the sections of the article.